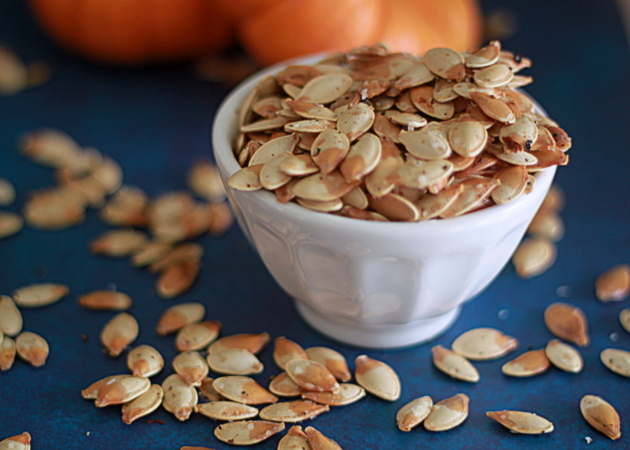 Delicious, healthy pumpkin seeds are the best pumpkin-carving snack. Whether you’re pureeing your own pumpkin or creating your jack o’masterpiece, don’t let these little gems go to waste! They’re easy to roast to crunchy, addicting perfection. 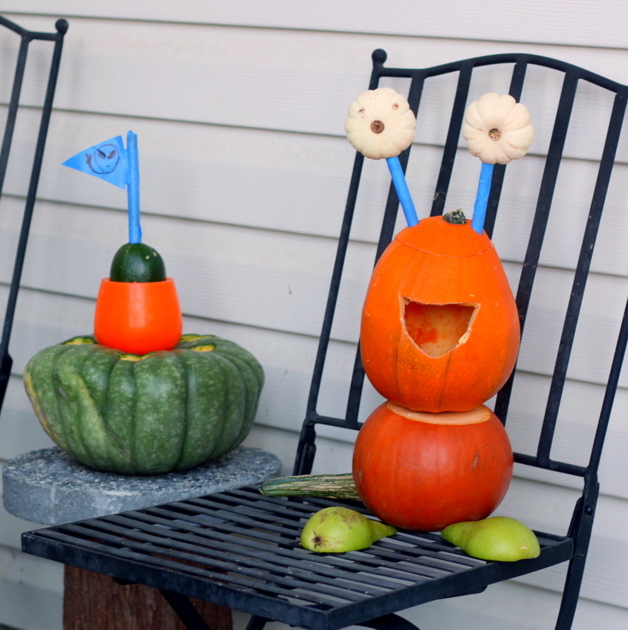 I originally published this one in 2012, but with pumpkin on my mind 24/7, I thought it was time to update with more photos and more thorough instructions. So excited for pumpkin (and pumpkin seed!) season! This Saturday is family pumpkin carving day. I adore pumpkin carving day. Anything that makes me feel like I’m back in school, happily lost in creating my own little spin on the latest art project, is a-ok by me. Another thing to love about pumpkin carving? The snacks we get out of it. 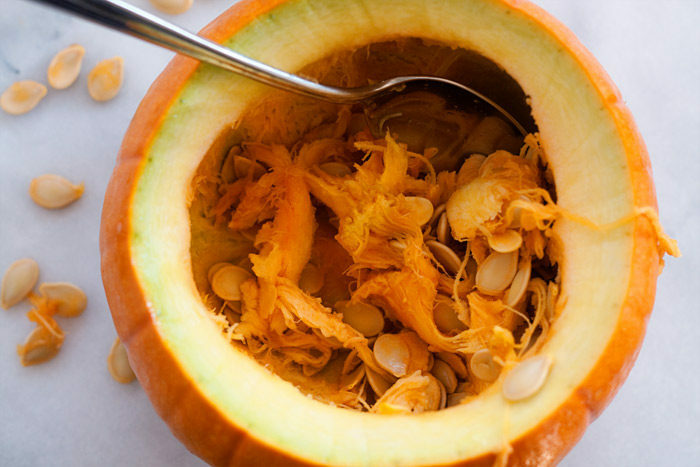 The snacks we literally get out of it – right out of the pumpkin. 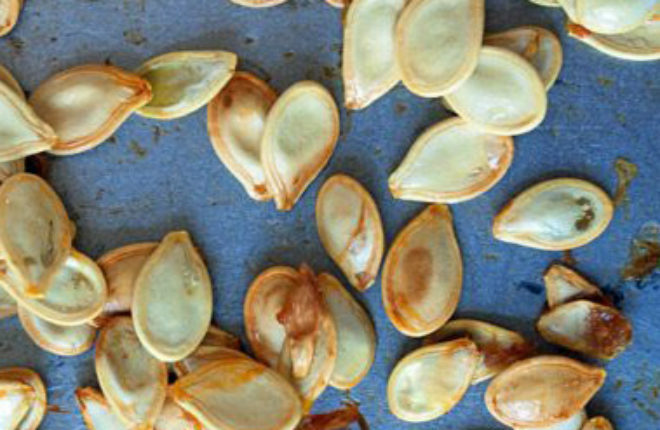 Grab those seeds you hollowed out of your pumpkin, season them just right, and you can roast pumpkin seeds right in your oven. They’ll get all perfectly crunchy and toasty brown while you’re working on your jack-o-masterpiece. The part of pumpkin carving that nobody talks about. 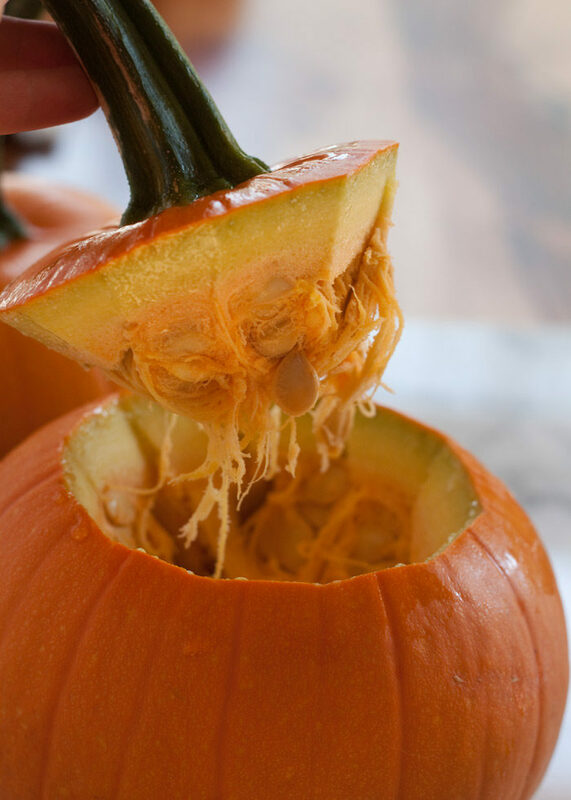 Cut off the top of your pumpkin and get grabbing at the guts! I like scrape a large spoon down the sides to help loosen them all up. Then place the mess of guts and seeds in a large bowl. Lay three or four dish towels on the counter. Fill the bowl with water and, with your hands, work the seeds off of the innards, discarding the larger pieces of guts after you’ve loosened the seeds. Most of the pumpkin seeds should float. Skim the seeds off of the top of the water and place on the layer of towels. Don’t worry, by the way, if you don’t get every last bit of the guts off. 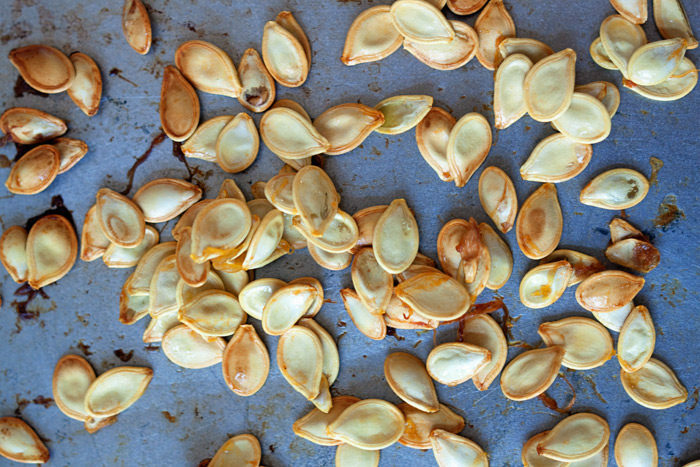 Those will mostly disappear when you roast the pumpkin seeds. 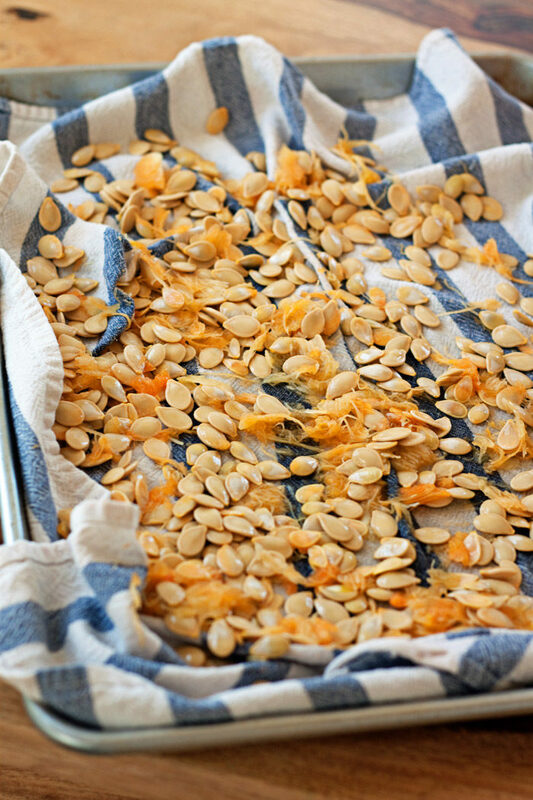 Allow seeds to dry for about an hour. Step 4: Oil, season, and bake! 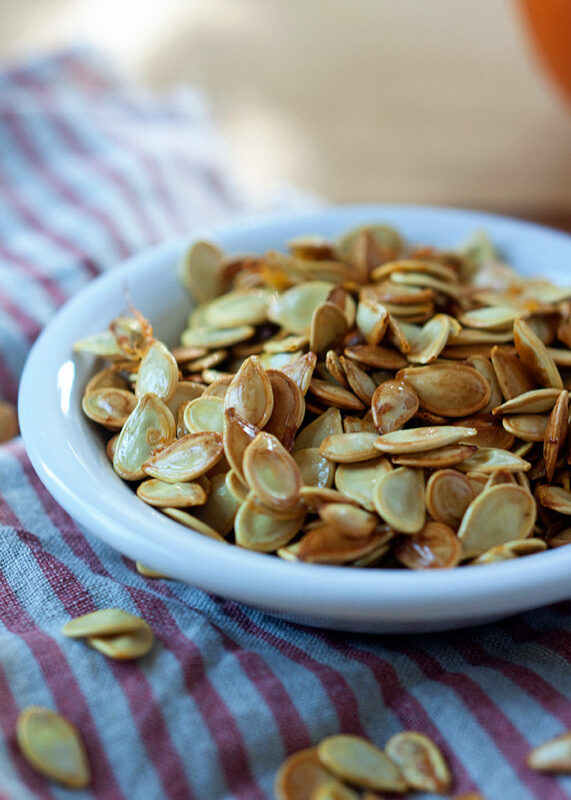 In a medium bowl, toss the seeds with oil (olive, vegetable, canola, or melted coconut oil work – about 1 teaspoon per cup of pumpkin seeds), a couple of pinches of salt, and other seasonings/flavorings as desired. Spread in a single layer on a baking sheet (either unlined or lined with a piece of parchment paper). Bake for about 25 minutes. Starting at about 15 minutes, stir the seeds every five minutes and keep a close eye on them until they begin turn light golden brown. Remove from oven and let cool for 5 – 10 minutes. Taste and add additional seasonings if desired. 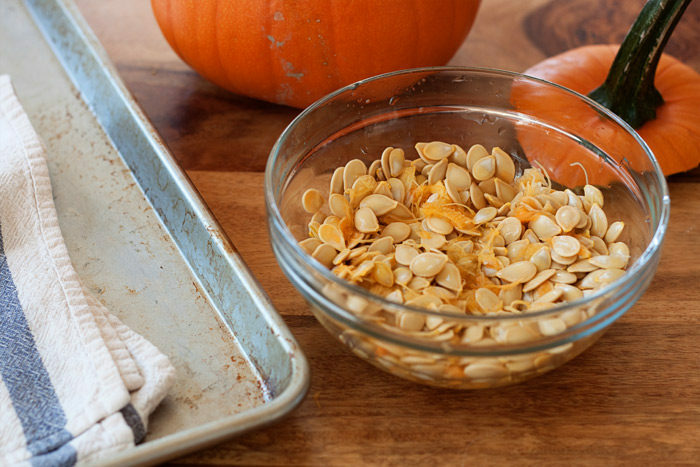 Pumpkin seeds will keep in a zippered bag at room temperature for about a week. Originally published Oct. 24, 2012. Updated and expanded Sept. 29, 2016. 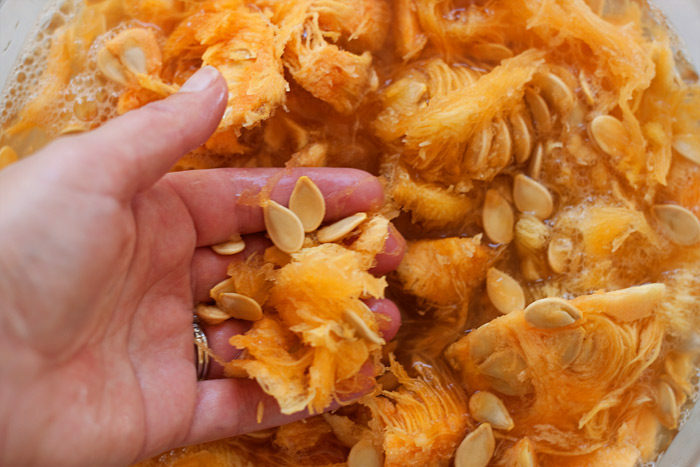 As you’re pulling the guts and seeds out of the pumpkin, place them in a large bowl. Lay three or four dish towels on the counter. Fill the bowl with water and, with your hands, work the seeds off of the innards, removing the innards. The pumpkin seeds will float. Skim the seeds off of the top of the water and place on the layer of towels. In a medium bowl, toss the seeds, oil, salt, and other seasonings/flavorings as desired. Spread in a single layer on a large baking sheet. Remove from oven and let cool for 5 – 10 minutes. Serve. In a medium bowl, mix together the seeds, vegetable oil, sugar, and salt. Toss until the seeds are well-coated. Spread on a well-greased cookie sheet (you may want to cover it with foil and grease the foil so clean-up will be less of a chore). Bake at for 45 minutes to an hour, stirring every 10 minutes or so, until the sugar and some of the pumpkin seeds have browned. Remove from the oven and let sit for about 10 minutes (they will be very, very hot!). After the initial 10 minutes, immediately remove from the cookie sheet and spread on a sheet of parchment paper, separating the seeds from one another as much as possible. Some of the seeds will stay stuck together. Sprinkle with a touch more salt, to taste. In a medium saucepan over medium-low heat, melt the butter and then stir in the brown sugar, salt, rosemary, cinnamon, cayenne pepper, and black pepper. Stir for 2 – 3 minutes until the sugar has mostly melted. 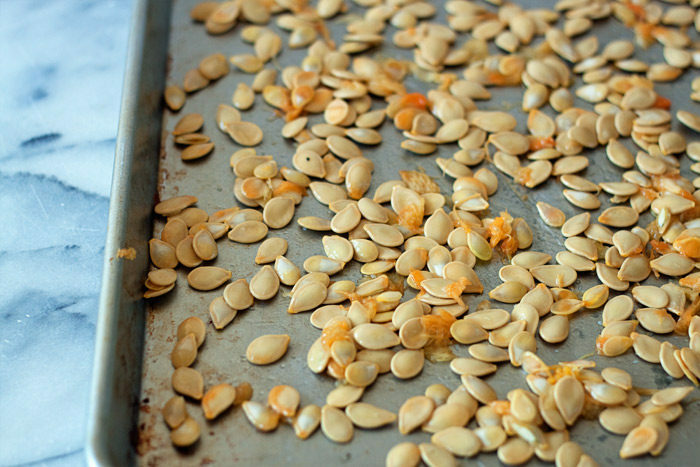 Remove from heat, and stir in the pumpkin seeds. Spread on a well-greased cookie sheet. You can also opt to line it with foil for easier clean-up, but it’s a little difficult to get the pumpkin seeds off of the foil (but doable). Bake for 20 – 25 minutes or until light golden brown, stirring 2 – 3 times during baking. In a medium bowl, toss the seeds, oil, salt, and pepper. Lay in a single layer on a large baking sheet. I want to attempt to carve a Domokun pumpkin, but I know it would be a big failure. Oh well. 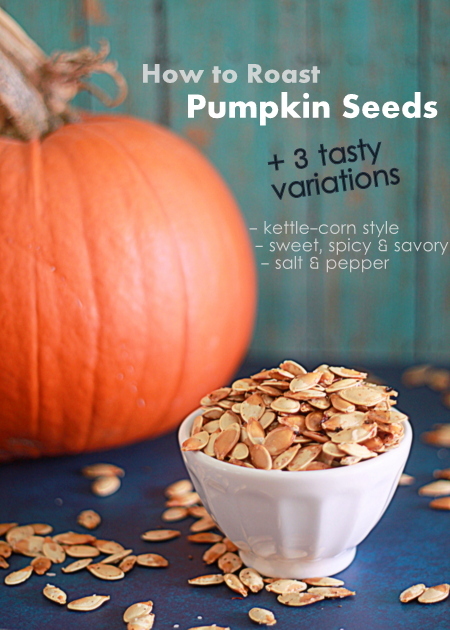 Hey, pumpkin seeds! The kettle corn ones sound so tasty. Usually I default to savory, but sweet would be delicious! I always told my children that there is no such thing as a stupid question, so here goes. 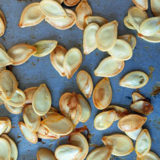 Pumpkin is a squash so do people eat other types of squash seeds too and the big question, how do you eat the seeds. The whole thing or is there a tasty bit in the middle like a sunflower seed? I have never had one. I like ‘pumpkin’ foods but the whole Jack-O-Lantern thing is not for me. My pumpkin puree usually come out of a can but I freeze a couple of bushels of pepper squash puree every year so I have lots of seeds. Hey Deb! I think you gave your children excellent advice. 🙂 I’m no squash seed effort but what I do know is you can eat the roasted, unhulled seeds of all kinds of winter squash – butternut, spaghetti – you name it. Just prepare them the same way. I’ve never heard of pepper squash but I am very intrigued! Some folks prefer them shelled (the green pepitas you find in the store are shelled pumpkin seeds) but when it comes to roasting them this way and eating them as a crunchy snack, I prefer to eat them with the shell on. I always need more coffee too. Thanks for the advice. I live in Canada and the squash I call “Pepper” are the smallish green ones with the deep ribs. I think they are also called “Acorn”. They are always cooked with the peels on. Some people like them with sugar or maple syrup but I just cut them in half, spread them with butter and add a sprinkle of salt and pepper and roast. So good. To cook for freezing I split, seed and them set them back together, the split lets the steam out, and bake on a shallow pan. After they cool I scoop the squash out of the shells and mash it into a smooth puree. Measure it into plastic freezer tubs, label and into the freezer it goes. Enough for a full year. Thank you for the work you do here. I enjoy it. I usually just dry the seeds and remove the kernels out for the baking. Thank you for sharing the tasty variations. Well… lately I did put the seeds in a non-stick baking sheet with no oil/seasoning whatsoever… and they are still awesome!